The first covers the arrival to and establishment of the Goths in and around the abandoned Roman province of Dacia between 260 and 350. In order to contextualise these raids geographically, it is preceded by a discussion of the many iterations of the Roman Empire’s territorial structure and administration between 107CE and 285CE. The second section considers the process through which the Goths seem to have fled from the Huns and entered the Roman Empire between 360 and 376. The third section describes the Gothic Wars between 376 and 395, including the battle of Adrianople, the rise of Theodosius, the usurpations of Maximus and Eugenius, the death of Gratian and the death of Theodosius. The most interesting and pervasive observation I make is the chaotic environment of Gothic and Roman fragmentation throughout the period considered. Thervingi were separate from Greutungi. Fritigern contested Athanaric. Theodosius may have been appointed by Illyrian Generals without the formal approval of Gratian. Magnus Maximus and Eugenius contested Theodosius. Alaric probably started out as the leader of a small regiment of Goths after the Battle of the Frigidus. Stilicho struggled with Rufinus and Eutropius. Gainas struggled with the praetorian prefects of the East. Alaric allies himself to Stilicho. Olympius overthrows Stilicho. Alaric invades Italy and sacks Rome and so on. The environment is completely chaotic. However, while fracture is the common element, it seems to move in opposite directions for the Empire and for the Goths. While the empire seems to become more fractionalised, Alaric’s leadership seems to slowly coalesce around a growing number of followers, which the following leaders inherit. However, as the empire falls and the borders between the Franks and the Goths slowly settle at the Pyrennees, fragmentation seems to slowly creep back into the Gothic fold, reverse its direction and accelerates exponentially with the arrival of the Umayyad expedition in the 8th century. 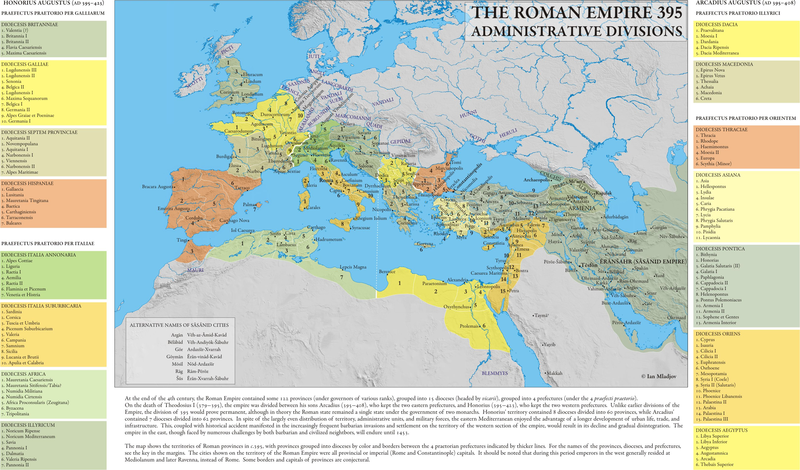 Before engaging in a discussion of the Goths, their incursions and their path across the Roman Empire, it is important to understand the geographical landscape and how the Roman territorial administration divided it throughout its occupation. This is best done in two parts: In the next paragraph I quickly run through the region that I shall be focusing the discussion on and quickly run through an example of how confusing talking about geography when discussing the Roman Empire nowadays can be. The paragraphs after that describe the accompanying graphs illustrating what is being discussed. The region of interest is what we normally includes the Balkans and ex-Yougoslasvia, but particularly focuses on Bulgaria, Romania and Macedonia with incursions often reaching as far south as Macedonia and Greece. The Romans knew these regions as Pannonia, Dalmatia and Illyricum and as Dacia, Moesia, Macedonia and Thracia. Dacia and Moesia are where most of the action will take place at first, before eventually moving south to Macedonia and Thracia at the end of the fourth century. Although I try to explicitly state what I’m referring to, it is not always easy to follow what is being talked about when a specific region is referred by name. I suppose that when I speak of “Macedonia” the reader could easily be confused between the many Macedonias of antiquity and modernity. There’s the Ancient Kingdom of Macedonia of Phillip and Alexander, the early Roman Province of Macedonia established after the conquest of Metellus, Diocletian’s Macedonias Prima and Salutaris and the Macedonias prevailing at the end of the fourth century, which included a Diocese and a Province (sub-division of a Diocese in the late empire). Similarly, there are many Moesias and Dacias. There’s Moesia simple, Moesia Superior and Moesia Inferior, Moesia I and Moesia II. There are even more Dacias: Dacia Traiana, Dacia Hadriana, Dacia Superior, Dacia Inferior, Dacia Porolissensis, Dassia Apulensis, Dacia Malvensis, Dacia Aureliana, the Diocesis of Dacia and its Dacian provinces Dacia Ripensis and Dacia Mediterranea. So let’s see if I can make sense of these Dacias. “Dacia Traiana” was the huge territory conquered by Trajan during his Dacian Wars between 101CE and 106CE. This was a huge territory limited by the Tisza and reaching beyond the Carpathians to the Prut River that incorporates parts of present-day Hungary, Romania and Bulgaria. To the east, beyond the figure below assumes that the territory extended as far as the Dniester, consistent with the theory of “Upper Trajan’s Wall”. This extension did not last long. Indeed, there is evidence to suggest that even before the end of the reign of Trajan in 117CE, the territories north of the Tisza beyond the Transylvanian plateau were held by the Free Dacians (those Dacians that survived Trajan’s conquests). As a result, it would not be entirely incorrect to speak of 2 Dacia Traianas, the biggest of the military conquests and the smallest administrative one. However, Dacia Traiana will be taken to refer to the larger territory, for simplicity. Thus, Hadrian inherited a large but much smaller Dacia than the one supposedly conquered by Trajan, confined to the Carpathians to the east and north and to the riversTisza and Mures to the west. The territory also included an extended Moesia inferior reaching north beyond the Danube. Hadrian then makes three territorial administrative reforms in the region. In 118CE he abandons the territory conquered beyond the Danube which had been attached to Moesia Inferior after 107CE. He twice reforms what I refer to as “Dacia Hadriana”. First, in 119CE by dividing that territory in two parts: Dacia Superior and Dacia Inferior. Then in 124CE Dacia Superior is divided into two: Dacia Porolissensis takes up the Transylvanian Plateau while and Dacia Apulensis contains the majority of the territory south of the Mures. At the same time, Dacia Inferior becomes Dacia Malvensis. The shift from Trajan’s Dacia to Hadrian’s Dacia was forced by the pressures of the Sarmatian Jazyges pushed eastwards from across the Tisza, while the Dacian Carpi pushed west and southwards from across the Carpathian mountains. While it appears that it was normal to distinguish the three Dacias by their specific name, the use of “Tres Dacia” for the collection of the three appears to have happened on occasions of military activity when the Emperors preferred to appoint a single governor for all of them. The dominant city of Dacia was the city of Ulpia Traiana Sarmizegetusa. Trajan’s conquests also extended the Roman Principate province of Moesia Inferior (which had been created by the division of Moesia simple into two by Domitian in 86CE) northwards beyond the Danube, east of Dacia Malvensis beyond the Olt. This was the state of affairs in the region by the death of Hadrian in 138CE. The subsequent 130 years see a lot of turnoil, particularly from 238CE onwards, which eventually leads to a retreat from Dacia in 271CE (according to MacKendrick (2000:117)), 272-273CE (according to Southern (2001:120-121)) or 275CE (according to Watson (2004:156)) on the orders of emperor Aurelian (270-275). This meant that “Tres Dacia” and its internal components, “Dacia Porolissensis” (north), “Dacia Apulensis” (centre; aka “Dacia Superior” under Trajan) and “Dacia Malvensis” (south; aka “Dacia Inferior” under Trajan) ceised to exist. Instead, Emperor Aurelian created “Dacia Aureliana”, supposedly by carving out the Eastern part of Moesia Superior. Whether originally set as such by Aurelian or eventually restructured during the reign ofDiocletian (284-305CE), “Dacia Aureliana” eventually became further divided into two other provinces, so that by the end of the reign of Theodosius in 395CE, in its stead existedDacia Ripensis to the north and Dacia Mediterranea to the south. To the east of the two, the remaining territory of what had once been Moesia Superior was divided intoPraevalitana, Moesia I and Dardania. In the new territorial administration system, these provinces were now sub-units of the Diocesis of Dacia. To the east, what had once been Moesia inferior, was merged with the Antonine province of Thracia to form the Diocesis of Thracia, itself subdivided into the provinces of Thracia, Rhodope, Haemimontus, Moesia II, Europa and Scythia. The image below puts most of these Dacias together. So how did these changes take place? The Roman conquest of Dacia appears to have been triggered by Dacian attacks led by king Duras sometime between the end of 85CE and the beginning of 86CE, during the reign of the last Flavian Roman Emperor Domitian. The war lasted until 88CE ahead of the insurrection of Saturninus in Germania Superior in 89CE. Although the province of Moesia was preserved, the war was considered a failure because of the failed invasion of the territories beyond the Danube. Rome was seen to appease the new Dacian king Decebalius who released Roman prisoners in exchange for engineers and an annual subsidy, both of which went to funding Dacia’s defences. As a military emperor and following the perceived humiliation of Domitian, Dacia was a natural target for the attention of Trajan as soon as he became emperor in 101CE. For the subsequent 6 years the territory was conquered and the new province added to the Empire. However, plenty of barbarian tribes were left to pester the Roman invaders. With the defeat of the majority of Dacians, Sarmatians and Germanics filled the void. TheSarmatian Jazygyes between the Danube and the Tisza, the Germanic Quadi to the north of these, the (likely) Dacian Carpi to the northeast of the Mures, the Sarmatian Roxolani to the southeast of the mouth of the Mures and the Germanic Bastarnae between the Prut and the Dniester remained a problem within the borders of Dacia Traiana. These pressures from the Jazyges, the Free Dacians, the Quadi, of the Carpi and of the Roxolani continued to be felt after the reign of Hadrian, fuelled as they were by the explosion of the Marcommanic wars over Pannonia. Between 166 and 185, Marcus Aurelius as Emperor, Pertinax as Governor of the three provinces and Commodus as Emperor all have to deal with raids across the Dacias. The result was a quick retreat of Dacia Traiana from the river borders afforded by the Tisza and the Prut to the eventual three Dacias of Hadrian (Porolissensis, Apuleia and Malvensis), protected by the Carpathian mountains. Moreover, the conquests that had extended Moesia Inferior across the Danube appears to have been abandoned by Hadrian in 118CE. The subsequent Severan dynasty witnessed a period of relative peace and stability in Dacia. To that effect it seems plausible that despite the ravages of the second half of the 2ndcentury, the borders of the 3 Dacias were more or less unchanged from the time of Hadrian. However, it was clearly a difficult province to defend in times of imperial crisis, and this was a problem amply provided for during the third century. Regardless of how they came to be there, we know for a fact that there were people that the Romans called Goths in the territories of present-day Romania, Bulgaria and the Ukraine by the mid-200s. Because of their specific location and prevailing Roman attitudes to the peoples beyond its borders, we also know that some authors for some time used Scythian and Sarmatian, Dacian and Getae, Scythian and Gothic and Getae and Gothicinterchangeably, confusing geographical and ethno-linguistic identification of the peoples, which makes analysis a bit complicated. Nevertheless, Kulikowski (2007:18) offers in my opinion the most complete description of the first established facts about the Goths. For the sake of description, I would argue that it is important to distinguish the initial activity of the Goths for the 130 years after they enter the stage and the developments that ensue from 360 onwards. The main reason for this is that as we shall see, early gothic activity is pretty much akin to piracy and raiding, not really that different from Viking incursions 600 years later. They are also one of many peoples, including some Sarmatians and other Germanic tribes. From 360CE onwards however, the Roman Empire begins dealing with the Goths separately and as a bloc/nation, first tied to a land and then as refugees. For the sake of simplicity I will divide the time between 230CE to 360CE into 5 approximate periods of Gothic raids: The first land raids between 238CE and 251CE; the first sea raids of the 250s, on the shores of the Black Sea; the second sea raids into the Aegean and Mediterranean seas in the 260s. The Roman victories ovr the Goths in the 270s and the dominance of Constantine in the 330s. The oldest reference to the arrival of the Goths in Dacia, (Rome’s north-eastern frontier) that I have been able to find comes from a text in FGrH (Fragments of the Greek Historians) attributed to Dexippus. It is concerned with the sack of Histria in 236CE or 238CE during the chaotic year of the 6 emperors by the Goths and the Carpi, most likely during the beginning of the year, when the reigning Emperor was still Maximinus Thrax. The leading forces seem to have been the Carpi, who by their absence from the historical record more or less until then may be deduced to have been Roman allies up to this point. There seems to be an argument that the Carpi felt that their alliance with Rome was less beneficial than enmity had been for other local tribes, which had been able to extract payments from Rome in exchange for peace. The argument that the raid of 236/9CE was motivated in this manner is explained by the fact that in 244CE Philip the Arab (244-249CE) decided to stop paying tributes. This appears to have force him to rush to Dacia and Moesia to quell another series of attacks from the Carpi, who seem to have descended from the Carpatians through the eastern edge of Dacia Apulensis in 2. If the end of payment of tributes was the cause of the incursions of the Carpi, then such payments had to start at some point and 236/8CE sounds like a good time to attribute that too, given that no other explanation is available for those incursions.Whatever the cause, the result was a Roman victory that allowed Phillip the Arab to take on the title of Carpicus Maximus. We also know that between 244-7CE the Limes Transalutanus that protected Dacia Malvensis from the South was abandoned due to attacks from the Carpi and the Goths and that the Castra of Răcarii de Jos was destroyed between 243CE and 247CE. Then, in 249CE two leaders of Gothic origin, Argaith and Guntheric sackedMarcianople according to Jordanes. This is probably what triggered the Battle of Abritus (modern-day Razgrad, Bulgaria) in 251, where according to Aurelius Victor’s Liber de Caesaribus the Roman Emperor Deciusperished at the hands of Goths and Heruli (which may have been based in Jutland in the 120s) led by a certain Cniva, whose victory imposed severe tribute payments on Rome. His Campaign appears to have begun by a crossing of the Danube at Oescus, moving south to Nicopolis, which they attempt to siege. Lifting the siege due to the arrival of Decius, the Goths moved south to Beroe, where they dispersed Roman soldiers and pillaged the area before turning west and successfully taking Phillipopolis. Slow at chasing them due to the winter conditions, Decius would have only caught the Goths on their way back north at Abritus, where the muddy terrain was one of the leading causes of his defeat (perhaps not unlike what happened at Agincourt). This is a period of huge turmoil for the Roman Empire, which is reeling from the end of the Severan Dynasty and the political instability that followed. In the struggle for power a long sequence of Roman generals plotted against and usurped each other and claim each the throne creating a continuous stream of civil wars. Indeed, there is some strong but inconclusive evidence to suggest that the battle of Phillipopolis in 250CE ended with the collusion of the city’s general, Titus Julius Priscus, proclaiming himself emperor before colluding with Cniva and moving against Decius at Abritus in 251CE. Dexippus (who we’ll return to shortly) also suggests a plot by the soon-to-be-emperor Trebonianus Gallus, then governor of one of the relevant border provinces where conflict with the Goths was taking place, Moesia Superior. No one seems bothered by the notion of a Moesian general defeating barbarians that should be in Cappadocia. There are 3 possible explanations for this. he caught them on the way back (see next figure). Up until this moment, the Goths, Getae or Carpi have shown no affinity for waterways beyond their ability to cross the Danube. The idea that they would have been able to cross the Bosphorus or the Dardanelles seems is an innovation worth noticing. All the sources and historians are relatively unfussed about this, which surprises me. “Pessinus, Cappadocia and Ephesus” are 3 fairly random locations to pick. BothEphesus and Pessinus make sense as religious centers that would have held some treasures, but Cappadocia is a bit distant and inland. The Goths may have been familiar with the region following their participation in the 244CE battle of Misiche on the side of the Romans. However, explaining why they would go there and not try to raid its capital Caesarea makes no sense. Clearly the city was worthy of enough attention for Shapur to have sacked it 7 years later. For all these reasons, I am open to the notion that the sources overstate the extension covered by the Goths. It makes more sense if they stayed in Moesia Inferior, both logistically and geo-politically. However, there’s no obvious conclusion to be reached on this matter. The reason I am not completely convinced by the idea that the raids of 253CE did not reach Cappadocia is that the Black Sea starts being pillaged 2 years later and is not fully recovered for another 15-years. The fact that the raids begin in the Eastern Black Sea however, is consistent with a different group of Goths that may not have benefitted from the lessons of the previous group, particularly when we remember that there most likely was no group to learn from as Aemilianus defeated them in 253CE. However, there seems to be some experiementation and venturing into the sea that is going on. that would be consistent with Black Sea raids that took place between 255-268. The Boranoi (Goths?) together with the Heruli and others conducted regular pirate raids, starting with a failed attack of Pytius on the eastern shores of the Black Sea in 255CE. The following year however, the attack proved more fruitful to the Goths who appear to have successfully pillaged Pytius and Trapezus. These successes were then followed in 257CE by a much larger force that devastated large areas of Bithynia and the Propontis, including the cities of Chalcedon, Nicomedia, Nicaea, Apamea, Cius and Prusa. It is difficult to say where they came form but the fact that by the end of the 250s Tyras and Olbia to the North of Scythia minor were held by the Goths is consistent with a presence around the mouths of theDniester and the Southern Bug rivers. Although it is impossible to determine, the presence of the the Danube Fleet “Classis Flavia Moesica” anchored at Tyras and other parts of the “Classis Histrica” or any boats captured at Histria in 236/8CE would have provided the Goths with the necessary fleet to conduct their raids. The The first group seems to have started its raids at Heraclea Pontica before moving to Byzantium, Cyzicus, Lemnos and Scyros. The Goths then managed through the passes of Thermopylae and attacked the Achaean cities of Athens, Corinth, Sparta and Olympia. This is the group that was supposedly reppelled by an Athenian militia led by the historian Dexippus that managed to push the invaders North to the Nestos (or Nessos) River. There, Gallienus’ Dalmatian cavalry achieved a victory forcing the Heruli leader Naulobatus to agree to an end of hostilities. The second group, appears either in parallel to or after the first. Assembled at Tyras, this fleet unsuccessfully attacks Tomi and Marcianople before moving south to Byzantium and Chrysopolis. They then move south through the Bosphorus, the Sea of Marmara, and theDardanelles to the Aegean Sea, probably sacking Troy and Ephesus and attacking Rhodesand Cyprus. Nothing is mentioned of their fate thereafter. They may have returned back to mainland Greece, but we don’t know. This is the second group whom supposedly Claudius II defeated to become Goticus. For both stories to be true, the first group would have had to attack in 267CE and the second one in 269CE, or something to that effect. This is because between he death of Gallienus in 268CE while campaigning against the usurpation of Aurelolus, it is necessary for him to have defeated the Goths at the River Nestos. After this (very successful) victory, he then gallops through Dalmatia to Italia where he is killed by his men during the campaign against Aureolus. That’s when the second attack begins at Tomi and Marcianople. Gallienus’ successor Claudius II then heads to Moesia. By the time he encounters the Goths, they have already started moving from Thessalonika north, through Paeonia and Pelagonia. Not that chaos is unlikely, but this much travelling, raiding, chasing and battling is not really easy to swallow with Occam’s razor and depends exclusively on our acceptance of Gallienus’ mighty Dalmatian cavalry army and its mobility. A more reasonable course of events would have been for the whole affair to have been handled by a single emperor. In that case my bet would be Claudius II Gothicus, given his title. This description of events would exclude the intermediate excursion through Italy to end Aureolus’ rebellion. This would also have explained the reason why the Goths were allowed to roam around freely for so long. In that case then, the sequence would be something like this: Galienus would have beem consul in Rome in 266CE. A campaign led by Aurelolus to defeat the Gallic Emperor Postumous fails in 267CE and leads to Aureolus’ demotion. Resentment and popularity lead him to rebel. Gallienus moves north (rather than west from Thracia) and is killed in 268CE during the siege of Milan. Meanwhile the Goths continue to roam freely leaving outfits like Dexippus’ milicia to handle things, since the failure of Decius, the usurpations of Aemilianus, Ingenuus andMacrianus constantly depleted the Danubian front. Meanwhile Claudius II becomes emperor and moves east to face the Goths. They hear of his approach and move to face him at Naissus. Defeated they retreat south and are defeated once again at the river Nestos in 270CE. – It’s possible but ultimately unknowable. What we do know is that there was still some fight left in the Goths and the Herulis, who are reported to have made one last incursion in 275CE, which was successfully dealt with by Emperor Tacitus so that he became Gothicus Maximus. To understand what’s going on it’s again important to contextualise these Gothic raids relatively to internal Roman developments. The 250s are the beginning of the reign of the ill-fated Emperor Valerian (253CE-260CE), He was Decius’ representative to the Senate between 249CE and 251CE and general of the Raetian army under the aforementionedTrebonianus Gallus (251CE -253CE). He appears to have been loyal to Trebonianus Gallusbut arrived too late to aid him against the usurper Aemilianus. However, when the latter’s short reign came to its inevitable end, upon the arrival of Valentinian a period of relative stability lasted approximately 5 years. Nevertheless, the defeat of Valerian at the battle of Edessa in 260CE creates ripples through the empire that trigger one usurpation after another: Macrianus, Valerian’s Treasurer, in the East, Postumus in Gaul, Ingenuus in Pannonia and Aemilianus in Egypt in 261CE. All these usurpations entailed civil wars and probably some alliances with local barbarians that made the empire’s borders even more porous than they were naturally. At the same time as all these movements are taking place something is going on inside Dacia itself. The information that the sources have left us with is very patchy, but we can paint a picture. The mines of Alburnus Maior had been abandoned by 215CE (although this appears to have been an economic rather than a military decision). In Apulum, the last coins to be found date from 258CE at the latest. Moreover, there is nothing to indicate that any further efforts were made to defend Dacia Malvensis since the Limes Transalutanus had been abandoned in 243-7CE. To the North, little information is available as to when the Limes Porolissensis were abandoned and the general assumption is that all the castra of Roman Dacia were abandoned in the very precise date of “during the third century”, which is not very useful. However, the discovery of ballista projectiles at the Castra Arcobara suggests that the troops may have had to leave in a hurry, sometime before the evacuation in 271CE. There also seem to have been a vast number of Gothic settlements in the region of Dacia Traiana during the 3rd and 4th centuries. Given these border problems, coupled with the internal instability of the Roman Empire and the end of the mining returns that were the main economic appeal of the province, it is not surprising to find Aurelian evacuating Dacia in 271CE and resettling the population in Moesia. To my knowledge only Sucidava and Drobeta remained under (intermitent) Roman control as bridgehead beyond the Danube until the reign of Justinian. What happened to the other Barbarian tribes? Before moving on to the next section, it is worth noticing that the many barbarian tribes that existed in the second century appear to be progressively replaced during the 3rd and 4th centuries CE by the Goths (around the lower Danube), the Alemmani (between the Rhine and the Danube) and the Franks (on the Danube). So what happened to the other tribes, particularly the ones on the lower Danube? The Jaziges sort of disappear. Some may have joined the Vandals, other the Goths while others still may simply have become the Jasz people of Iranian descent in Hungary. The Carpi were consecutive and successfully defeated and had been deported and relocated into the Roman Empire by the end of Julian the Apostate’s reign. The Roxolani appear to have had a mixed relation with the empire that saw many of them join Rome after failed raids over Pannonia in 260CE; however, they appear to have been ultimately defeated by the Huns in the 5th century. The Pannonia campaign of 260CE, suggests that they would have crossed and ravaged Dacia at some point between 260CE and 238CE. The Quadi turned their attention west to Pannonia, Raetia and Noricum on the Rhine during the reign of Valentinian, joining forces with Alemmani and Sarmatians. They are last recorded as having killed that Roman Emperor with a heart attack caused by the outrage of their demands on November 17 375. They may also have been part of the group of the broader Suebi that settled in Iberia Galicia in the 5th century, followingthe crossing of the Rhine. The Bastarnae seem to have been successively settled into the province of Moesia by Probus in 273CE and by Diocletian in 299CE, following alliances and rebellions against Rome. Those that remained may have been absorbed into the Goths or the many Hunnic clients. After this intense activity history is silence about the Goths until the reign of Constantine. Although Galerius and Diocletian fought the Sarmatians and the Carpi, no conflict with the Goths appear to have been recorded. However, Constantine defeats the Goths once again in 322CE and 323CE. At this stage the Goths appear to make a return to history. In 324CE they are hired as mercenaries by Licinius Constantine’s final antagonist. Constantine faces off against them one more time in 332CE and at by the end of his rule had as many as 40,000 Goths move to Constantinople as his personal guard. According to Wolfram, prior to their arrival in the Roman Empire, the Goths were mainly divided into two groups, the Thervingi and Greutungi tribes. The main group of interest is the Thervingi/Visigoths, whom we first hear of in 291, at the end of the Crisis of the Third Century in a panegyric of Maximian by Claudian. According to Kulikowski (2007:31),Diocletian had already been campaigning against them in 381. They were led by a certainAriaric (291-332), who as a result is the first king of the Thervingi whose existence is historically proven (i.e. : independent from Jordannes). It’s important to bear in mind that the word king in this context is used less in analogy to Louis IV or Henry VIII and more in analogy to Agamemnon, Vercingetorix, Ambiorix, Boudica or Clovis. They were local grandees or military leaders that through cheer charisma and political manipulation managed to unite a large number of troops from a broad geographical area tied by loose but clear ethnic ties (language and cultural practices, not necessarily racial) for the purposes of aggressive raiding and self-defence. Some Roman sources call them “magistrates”, which. In regards to day-to-day life, government beyond any form of dispute resolution would have been limited by the illiteracy of such a culture. Prior to entering the Roman Empire, the Goths were certainly not a very legalistic or centralised Government. Ariaric’s reign coincided with the end of the Tetrarchy and the beginning of Constantine the Great’s reign who in 332, the last year of Ariaric’s reign, imposed a destructive defeaton the Thervingi. Peter Heather (2005:162) reports that Constantine’s victory demanded of the defeated that they serve as auxiliaries in the Roman army, political hostages and offered them some tribute payment [Peter Heather (2005:74)] as an incentive for good behaviour. According to Heather and Matthews (1991:19) they did fight with the Romans against the Persians in 348, 360 and in Julian’s ill-fated 363 campaign. Of all the Goths, the Thervingi are the main focus of history on account of their earlier arrival, later departure and more important action on the collapse of the Roman Empire. Indeed, theGreutungi are mentioned first only in 372. At that stage, it would appear that the two groups were separated by the Dniester river, with the Thervingi dominating the large region on the south/west side of that river around the Carpathians and the Greutungi to the east of the river. The next leader was Aoric (332-350), a son of Ariaric. His reign may have witnessed some persecutions of Christians probably the Arian converts of Ulfilas. During his 7-year stay with them in the 340, Ulfilas may have overreached and converted Goths rather than just officiate to a purely Roman flock. The next leader, Geberic (350-365), subsequently conquered Dacia from the Vandals, according to Jordanes. The next leader, Athanaric (365-376) is normally identified as the first King of theVisigoths, possibly the last king of the Thervingi. His father was one of the hostages sent to be educated in Constantinople after Constantine’s 332 victory over Ariaric and appears to have instilled a hatred of all things Roman on Athanaric [Peter Heather (2005:75)]. According to Peter Heather (2005:73) Athanaric came into conflict with Valens after sending a contingent of his Thervingi soldiers to support the claims of Procopius the usurper, uncle of the late Emperor Julian in 365. For the next 4 years, Valens pursued him unsuccessfully, until in 369, potentially [Peter Heather (2005:73)] foreseeing the coming 371 war with Shapur II of Persia [Dignas and Winter (2007:183)] after the latter killedArsaces II, King of Armenia [Dignas and Winter (2007:269)], Valens gave up his efforts to definitively defeat the Goths and moved East to face his next struggle without the contingents that the Roman Empire’s East had been able to count on since 332. Peter Heather (2005:73) argues that Athanaric pursued a clear policy of independence and distance from Roman central power. Keen to eliminate its competing influence, whichContantius II had pursued by the missionary work of Ulfilas and the successful conversion of some Goths to the Emperor’s Arian flavour of Christianity, Athanaric actively persecuted them in the early 370s. At this stage Ammianus Marcellinus introduces Ermanaric, leader of the Greutungi, who according to Jordanes was the son of Achiulf, grandson of Amal from whom the Amali Dynasty of Ostrogothic kings takes its name. Ermanaric (350-375) is important for 3 reasons. First, he is considered to have been a great warrior boasting the title of “Gothic Alexander”. Secondly, Book 31 of Ammianus Marcellinus Roman Antiquities records the arrival of the Huns onto the Easter border of the Greutungi’s lands by the Tanaïs, where they defeat and absorb the Alans (whom Ammianus refers to as Halani) into their troops. At this stage, Ammianus tells us that after “a firm and continued stand” against the attacks of the Huns on his people, Ermanaric took his own life. Peter Heather (2005:151) argues that this took place around 375 amd would have been was a ritual sacrifice of the then aged Ermanaric in order to gain the “safety of his people”. Attempting to stop these Greutungi refugees from entering his territory, Athanaric’sThervingi eventually are overwhelmed by the arrival of Hunnic forces. Following defeats,Ammianus reports that an off-shoot of the Thervingi led by Alavivus eventually moved south and asked Valens for safe-passage into Roman Thrace. Here, chapter 33 of BookIV of Socrates Scholasticus’ Ecclesiastical History adds to Alavivus another leader of theThervingi who had broken away from Athanaric, Fritigern (376-380). The same source explains that in the struggle for power with Athanaric, Fritigern appealed to Valens for aid, which he received, supposedly defeating Athanaric, who disappears from the historical record for the next 5 years. At this stage, Fritigern is said to have converted to Arian Christianity, the Christian sect that Ulfilas had spread, which Athanaric had persecuted and which was favoured by Valens, a good way to seal an alliance. At this stage, although one mentions Alavivus while the other puts the Thervingi under the leadership of Fritigern, both Ammianus and Socrates Scholasticus agree that the pressure of the Huns pushed the Thervingi to request asylum in Roman territory beyond the Danube. While the Thervingi’s ambassadors made the journey all the way to Antioch where conflicts with Persia over Armenia had taken Valens, the Thervingi awaited on the banks of the Danube. This was a request for asylum, not an invasion and the Roman had some leverage once again. The perception that Ammianus gives us is that Valens was thinking of taking advantage of this situation restored the arrangement that had prevailed since Constantine’s victory until 369 and regained access to auxiliary troops from the Thervingi, which he was probably hoping to use against the main threat: Persia. As I mentioned elsewhere, ultimately this miscalculation of priorities between the Gothic threat in Thrace and the Persian advance into Armenia was the cause of the beginning of the fall of Rome. Ammianus tells us that Valens allowed the Thervingi’s into the empire and agreed to settle them in Thrace. This is most likely the Diocese, not the province. The specific provinces favoured for the settlement of the Goths in the Diocese of Thrace were Scytia (Minor),Moesia II, Dacia Ripensis and or Moesia I in the Northern-most part of the Balkans. At the same time, a group of Greutungi nominally led by Viderichus under the real guidance ofAlatheus and Saphrax attempted to gain similar favour with the Romans but was rejected. However, the slow pace of the cross of the Thervingi allowed the Greutungi to cross as well, so that contingents of both groups now found themselves in Roman territory. At this moment a headcount seems appropriate. Peter Heather (2005:182) recons that at most, something along the lines of 200,000 Goths crossed the Danube between 376 and 378. According to a well-established ratio of 1 warrior for every 4 people in this type of population movements, he suggests that in total, the Goths may have been able to field an army of 50,000 soldiers. This is when the Romans begin to have problems, supposedly brought about by the greed and mismanagement of Lupicinus and Maximus, dux of Thrace and Moesia respectively. They who built discontent among the Goths by starving them and forcing them to sell their offspring into slavery in exchange for dog meat. Furthermore, having agreed to receive theThervingi leaders Fritigern and Alavivus in Marcianopolis, for negotiations where they tried killing the two, but failed to kill the first. Thus began the revolt of the Goths on Roman soil in 376 that would lead to the fatal Battle of Adrianople on August 9th, 378. At Adrianople, after a year of the Thervingi’ devastating the Thracian country-side that forced Valens to send Themistius to request the Western assistance of his nephew, the emperor Gratian, he finally left Antioch for Constantinople. Forces started arriving from the East in February 378 on the 30th of May 378, according to Peter Heather (2005:177). This suggests the arrival of a vast army and of complex logistical arrangements as the journey from Antioch to Constantinople seems to have lasted over 37 days. Peter Heather (2005:181) argues that the Valens would not have been able to extract all of the forces available to him in the Eastern front and so would have come from Antioch with approximately 15,000 soldiers. Expecting a similarly sized reinforcement from Gratian, he would have been counting on a 2:1 numerical advantage over the Goths. At this stage there were 2 Pannonias in the Diocese of Illyricum. “Pannonia I” hadSavaria (Szombathely in present day Hungary) as its capital, while “Pannonia II” hadSirmium as its capital. The sources don’t seem to be explicit about which one of the two Gratian troops had to be recalled from. It would have taken a marching army almost 10 days to cover the 589km from Ravenna to Savaria by land a total of 13 days to Sirmium. The closest location I could find to the Argentovaria (close to present-day Colmar) isArgentoratum, present-day Strasbourg. From Savaria to Argentoratum it would have taken 16 days, while from Sirmium to Argentoratum it would have taken the better part of 23 days. Delayed though he may have been, Gratian did send one of his generals, a certain Sebastianus, with a contingent of 2,000 soldiers to support his uncle in Thrace. Given that it would have taken 22 days to go from Savaria to Adrianople and 14 days fromSirmium to Adrianople, the first confrontation between Gratian’s Sebastianus and the Goths could have taken place as early as March 378, which is unlikely because ancient armies didn’t really fight during the winter. When they finally started the 37 day journey covering the 2129km from Argentoratumto Adrianople, we are told that Gratian’s forces were further delayed at this stage when they encountered a group of Alans 400km from Adrianople by Castra Martis, close toSerdica (31 days and 1805km into their journey). Tired of waiting, thirsty for glory, supported by the sycophancy of some of his generals and convinced that he was only facing a Thervingi force under Fritigern of 10,000 soldiers [Peter Heather (2005:178)] Valens decided to advance towards Adrianople where the Goths were. First, the battle begins chaotically, we are told by Ammianus how Richomeres, sent by Gratian, agreed to be part of a hostage exchange ahead of negotiations with the Goths which was botched by the disorderly beginning of hostilities from Roman archers, which shows the chaos on the ground. The second interesting development was that the 10,000 estimate of Fritigern’sThervingi force proved to be ultimately ignorant of the Greutungi cavalry underAlatheus and Saphrax, as well as some Alans, whose arrival destroyed the Roman left flank and won the battle for the Goths. This suggests the possibility of a relatively sophisticated level of coordination between the two groups of Goths. First, the Goths separated along their familiar Thervingi and Greutungi lines after the battle. Peter Heather (2005:178) says that while the Greutungi under Alatheus andSaphrax moved to Pannonia where they would have been defeated by Gratian,Fritigern’s people moved south and spent the years of 378- pillaging Macedonia and Thessalonica. Second, Gratian returns to the West in order to deal with Alemanni threats of his own without finishing the Goths. In my opinion, the legitimacy of this move is not necessarily as suspicious or incompetent as Kulikowski (2007:149) Of course a dedicated, strategic and militarily experienced emperor would have reorganised the army and coordinated a counterattack, possibly defeating the Goths during their failedsiege of Hadrianople or the subsequent battle of Constantinople. A weak emperor instead decided to retreat. Third, a certain Julius, magister militum in the East decides to massacre Goths in the service of Rome for fear that they may rebel upon hearing the news of the victory of their kinsmen. This type of initiative is typical of the chaotic period of power vacuum between the battle in August 378 and the supposed rise of Theodosius at the end of 378. Fourth, by the end of the year in 378, Theodosius was recalled from his retirement in Gallaecia in Hispania, at the latest. Theodosius: At Adrianople or recalled? This Theodosius was the son of Count Theodosius who had served under Gratian’s fatherValentinian I, until 376. Shortly after Valentinian I died on 17 November 375, Count Theodosius was murdered in the transition from the rule of Valentinian I to the rule of Gratian [John Mattews (1975:64)] in order to mitigate his enormous influence. He had had an extremely successful career that saw him suppress the Great Conspiracy of 367-368 in Britain, campaign with Valentinian I against the Alemanni sometime between 370 and 372 and defeat the Moorish rebel Firmus in 374. To avoid further threats, Theodosius (junior) then Dux Moesiae retired to his family’s Gallaecian estates in Hispania in the aftermath of his father murder in 376, leaving the ground free for the aforementionedMaximus to exploit the Goths after their arrival. Thus his retirement lasted only around 2 years. There are 2 alternative interpretations of the events that led to the rise ofTheodosius. On the one hand, John Matthews (1975:91) argues that Gratian decided to recall Theodosius as magister militum (probably per Illyricum) after the Battle of Adrianople. Matthews’ narrative is complicated by the fact the fact that Theodosius’ downfall was brought about by the rise of Gratian. Had Gratian been the one behind the appointment of a magister militum per Ilyricum, he would have likely appointed a Frank or an Alan as he did in the West. He could have appointed Theodosius in order to get rid of him in the West as a potential competitor, but if there was such a concern, he could have just had him killed. Instead, Kulikowski (2007:149) argues that with the 378 campaign against the Goths in the Thrace on the horizon, Theodosius and his connections in the Western court were able to leverage his experience as Dux Moesiae and “secure his reappointment to that post either shortly before or immediately after Adrianople”. It should be said that although rare, it was not unheard of for banished generals to make a come back, if their loyalty could be trusted. It should also be said that while Theodosiusmay not have enjoyed his father’s reputation and glory, there is no evidence to suggest that he performed poorly when appointed Dux Moesiae, as Kulikowski (2007:148) seems to imply .On the contrary, he defeated a Sarmatian incursion sometime between 372 and 373, after two legions had failed to do so. Whatever the reasons for his return to active duty, he was elevated to Eastern Emperor on January 19th 379 [John Mattews(1975:91)], around 5 and a half months after the Battle of Adrianople on August 10th, 378. It seems to me that the timing of this sequence of events probably supports the view that he was already in the East in 378. According to the best estimates by ORBIS, at best he could have crossed the 3014Km between Bracara Augusta and reached the Western coast of the Diocese of Macedonia (at Dyrrachium) in 13.5 days. However, the news would have taken at least 1.5 days to reach Gratian, presumably still in the vicinity of Serdica where he met the Alans en route to Adrianople. Gratian would then have had to debate it and for say another day before sending an envoy (agentes in rebus) to re-commission Theodosius inGallaecia. The fastest that the 3369km from Serdica there could have been covered in would have been 15 days. Finally, the estimate that gets Theodosius to Dyrrachium in 13.5 days is based on the journey being done at 250km/day by horse relay, which is not credible. He would have come with his family and carrying luggage, which have slowed him down, say at least to the 60km/day pace of a fast carriage making his journey to Serdica last 35 days at least. Taking all these things into account, it would have taken between 50 and 55 days between the Battle of Adrianople and the arrival of Theodosius to the Thrace, who would have happened in the beginning of October at best. This would have left him with 3.5 months to go from inconvenient retiree to emperor, which seems unlikely but not impossible, in light of Gratian’s absence. The details of the campaigns of Theodosius against the Goths are unknown, but they would have taken up almost all his time between the end of 378 and November 380, given that it was only at that later date that he entered Constantinople. Kulikowski (2007:151)shows that the purge of Julius would have been limited in its scope as Modares, a Gothic general in imperial employ served successfully under Theodosius, defeating some ofFritigern’s Goths in Thrace during 379. Kulikowski (2007:151), based on the sometimes confused Zosimus, argues that by 380 Fritigern’s forces had been repelled from theDiocese of Thrace in the Praetorian Prefecture of the East to the Praetorian Prefecture of Illyricum. There, he tells us that Fritigern achieved a victory in the Diocese of Macedoniathat was successful enough to cause desertions among Theodosius’ troops, as attested by his issuance of laws against it around that time of the Codex Theodisianus. Indeed the campaign cannot have been very successful given that the Goths survived to agree to a peace treaty in 382 rather than for some victory of Theodosius over them to be celebrated.Kulikowski (2007) further suggests that the formal reception given to an aged Athanaricwho came to die in Constantinople [John Matthews (1975:92)], very much against the wishes of his late father apparently [Peter Heather (2005:75)], was further evidence ofTheodosius’ weak position. Apparently the aftermath of Adrianople was a stalemate, in that neither side really got what it wanted. As a result of their success at Adrianople and of Theodosius’ inability to end their incursions, Fritigern’s Goths were established as foederati in Thrace, according to Kulikowski (2007:153). At the same time the peace may have been very costly for Goths and the Romans probably did extract something for themselves. Indeed, the very status offoederatus bound them to serve as auxiliaries at the request of Theodosius. An interesting further issue of contention emerges in relation to their leadership. While both Heather and Kuliowsky agree that Alatheus, Saphrax and Fritigern disappear from the historical record, to Peter Heather (2005:186) this suggests that they may have been sacrificed for the sake of the peace of 382. Kulikowski (2007:152) however, finds such action to be “beyond imperial abilities”. From 382 until 395, only very limited references are made to the Goths. IndeedKulikowski (2007:152) refers to the quote by Themistius based on Isaiah that the Gothstraded their swords for ploughs as a support that those Goths were pacified. Meanwhile, no further distinction is made between Thervingi and Greutungi after the peace of 382, which suggests to Peter Heather (2005:213) it was agreed with both groups. Ulfilas’ Gothi minors continued to live in the Roman province of Scythia. Peter Heather (2005:213) also tells us of a certain Odotheus who led a group ofGreutungi in 386 that were defeated by Promotus. An attack on Theodosius that almost killed him when he returned from the campaign against Magnus Maximus in 389 [Kulikowski (2007:161)]. Alaric may have been involved in this battle and we are told that Promotus’ intervention gained him a promotion above the rank of magister equitum that he already held by 388. There is a clear existence to a range of Gothic generals in the Roman Army of Theodosius, including Modares, Gainas, Fravitta and Eriulf [Kulikowski (2007:156)]. Another Genereral with a prominent history is Botheric who was stationed in Thessalonica [Kulikowski (2007:160)]. His presence there considered a clear sign that trouble was brewing in the Balkans as such appointments were normally only made under those circumstances. His existence and the facts of his death are brought to us by their consequences, which gave Ambrose his most prominent moment of power whenhe excommunicated Theodosius.